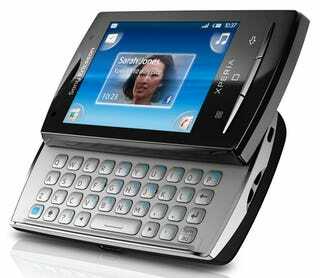 The X10 was Sony Ericsson's first Android phone and had really decent specs, yet failed to impress us. Dumbing it down and adding a "Mini" and "Mini Pro" tag doesn't sound too promising. They're both on sale in the second quarter of 2010, and run Android 1.6, with a 2.6-inch touchscreen and 5.0-megapixel camera and 600MHz processors. You may be wondering what separates the Mini from the Mini Pro, considering they're both very similar sounding so far. It's just the addition of a slide-out QWERTY on the Mini Pro—and some extra colors for the Mini. Greeeeaaat. Today sees the announcement of Xperia™ X10 mini and X10 mini pro, compact versions of Xperia™ X10, which will deliver powerful and application packed mobile phones into the industry. By introducing mobile phones that are both compact and clever, Sony Ericsson is challenging the norm and defining a brand new offering that combines high specification features with a version of Sony Ericsson's powerful UX platform specifically designed for smaller devices. Xperia™ X10 mini and X10 mini pro with slide out QWERTY keyboard offer an open and intuitive communication entertainment experience and build on the human curvature design philosophy debuted by the Sony Ericsson Xperia™ X10. Combining the Android platform with signature applications and a customisable UX platform, communication truly becomes entertainment with these new mobile phones. To enhance the experience, pick and choose from a multitude of applications at Android Market™ and co-create a mobile phone experience that is entirely unique. Users can go one step further and customise the home screen's four corners and widgets to access the most needed applications for limitless possibilities. The two sister mobile phones incorporate the signature application Sony Ericsson Timescape™ which brings all communication together in one place so users can see at a glance text messages, missed calls, and Facebook™ and Twitter updates, without having to open lots of different applications. The interactive music player also uses the "infinite button" to pull together all music content from the music store and YouTube™ – a smart way to search for new tracks from a favourite artist. "There has been an enormous buzz around Xperia™ X10 so it is really exciting to be already unveiling compact versions of this powerful proposition." Said Rikko Sakaguchi, EVP and Chief Creation Officer, Sony Ericsson. "With the X10 mini and X10 mini pro we have pushed the boundaries of what is possible with smaller devices and are giving consumers exactly what they want; two high performance mobile phones with a fully customisable user experience platform and a stunning ultra-compact design."